Vintage car buffs have long been fans of International Harvester Scouts. A few little-known facts make it one of the more interesting vehicles manufactured in the United States. Created to compete with the Jeep, the original IH Scout was developed and ultimately produced in less than two years time—a remarkable achievement in the automotive industry in the 1960s. The International Harvester Company, founded in the United States in 1902 when J.P. Morgan merged four small agricultural equipment firms into one, manufactured both the International Harvester pickup trucks and the off-road utility vehicles. The company produced the Scout itself from 1960 to 1980, a precursor to the boom in sport utility vehicles (SUVs) that would follow. The public got their first glimpse of the Scout line on January 18, 1961. The first one to roll off the production line was available in both two-wheel-drive and four-wheel-drive (2WD and 4WD) versions. It featured a 93-hp 4-cylinder engine, with three-speed, floor-mounted transmission. The first Scout V-8 was built in 1967, and it was powered by a 266-cubic-inch engine. The Scout 80 was the model designation for the early model Scouts, produced from 1961 to mid-1965. They had sliding windows, a 152-hp 4-cylinder engine, a fold-down windshield, vacuum windshield wipers at the top of the windshield, and an IH logo in the center of the grill. The Scout 800 was the model designation for Scouts produced from late 1965 to mid-1971. They were manufactured with more creature comforts and had a fixed windshield, fancier bucket seats, and windshield wipers located at the bottom of the windshield. They came with an optional 196 4-cylinder or 232 Inline-6 engine. The models produced in 1967 came with a 266 V-8, and the 1969 models had a 304 V-8. All models now had the International nameplate instead of the IH logo on the grill. Scout sales through the 1960s exceeded total sales of all Universal Jeeps. The Scout II (Scout 2) debuted in April 1971 and incorporated vehicle improvements that engineers had determined necessary during manufacture of the original Scout. In 1973, the 196 4-cylinder engine was dropped from the Scout line. 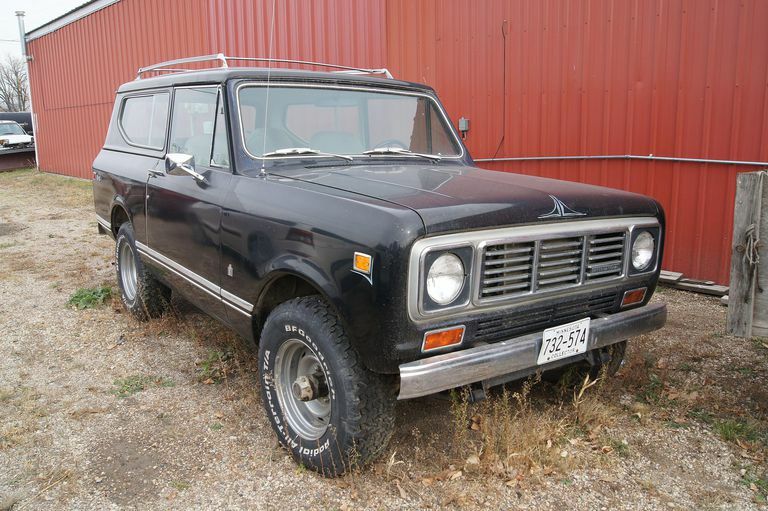 Due to the energy crisis, however, International reintroduced the 196 4-cylinder engine to the Scout line in 1974. In November 1977, a Scout SS II, driven by Jerry L. Boone of Parker, Arizona, finished first among 4WD production vehicles in the Baja 1000—one of the most challenging of all off-road competitions. Boone crossed the finish line almost two hours ahead of his closest competitor, a Jeep CJ7. Boone completed the run in 19 hours and 58 minutes. IH developed a policy in October 1978 titled “Take a Stand to Save the Land” to promote ecologically minded 4x4 driving practices. In 1980, the last year of production, all Scout models were 4WD. The SS II (Super Scout) model debuted in 1977 as a soft-top, soft door, open-air grill edition that was popular with outdoor enthusiasts. Nearly 4,000 SS IIs were produced between 1977 and 1979.